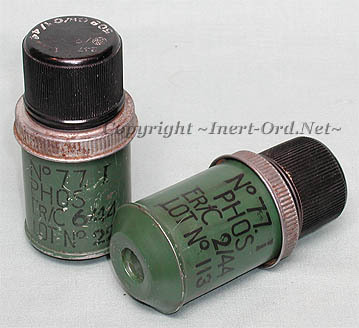 Introduced in early 1943, this small white phosphorus grenade was intended for signaling and screening purposes but, like all WP grenades, it found greater battlefield value as an anti-personnel / incendiary weapon. The grenade contained 8 ounces of White Phosphorus filling, with an impact fuze. The detonator bursts the grenade, scattering the contents which spontaneously ignites on contact with air. After the war, grenades in British inventory were found to have bodies which were corroding due to inferior tin plate steel used to manufacture the grenades. The grenade was declared obsolete in 1948 and stockpiles were destroyed for safety reasons. During the war, Canada also produced copies of the No.77, which were found to be of better manufacture and remained in service until the 1950's. This grenade was superseded by the No.80 Smoke, almost twice its size and using a conventional striker release time fuze, making it better suited to clear bunkers for instance, where an impact type would be ineffective. Weight-for-weight, phosphorus is the most effective smoke-screening agent known. It interacts with the surrounding atmosphere developing a large screening mass, producing 3.2 kilograms of smoke for every kilogram of WP you started with. The burst produces a characteristic shower of pure white smoke, particles spraying outward. The cloud forms in a fraction of a second, and coalesces into a thick fluffy mass. The smoke particles, in an aerosol mist, actually scatter visible light, doing more than merely obstructing the view. They absorb infrared radiation as well (a very useful feature on the modern battlefield). The burst also produces larger pieces of slowly burning phosphorus. White Phosphorus has an extremely toxic nature. One of the by-products of WP combustion is phosphoric acid, which can lead to damage of lungs and throat. 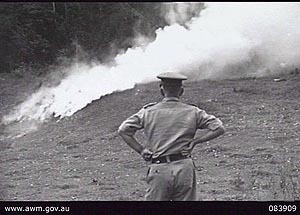 While initial superficial contact with burning particles can be less severe compared to things like napalm or metal incendiaries, particles will continue to burn long after initial exposure. Medical care can be very difficult if any are inhaled, ingested or become deeply imbedded in the skin. All this makes for an intimidating weapon. Soldiers who will stand firm when faced with gun fire and high explosive bursts will often retreat from a barrage of WP. Maj. Gen. E.J. 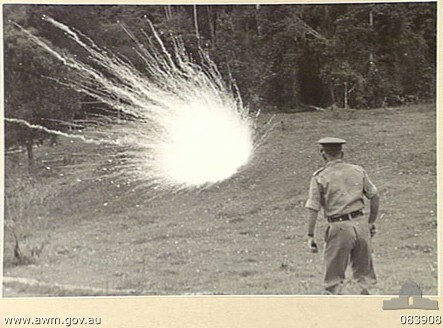 Milford watches the burst from a No.77 WP Mk.I thrown by him during demonstrations at HQ 7 Division.